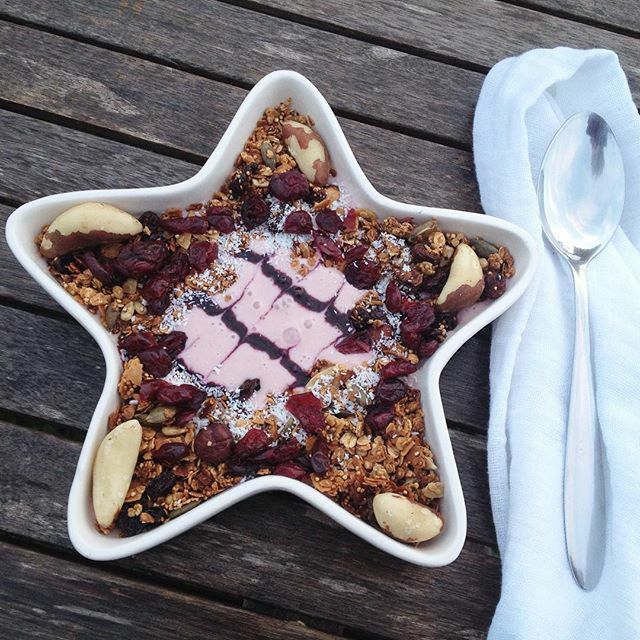 Quick and easy Homemade Muesli Recipe. Making homemade muesli can be so easy. One of my favorite recipes is by Kayla Itsines, the author of the world famous Bikini Body Guide. You can see her recipe here! This is my second time using this method. You can add your own favorite ingredients or take off ones you don’t like, or don’t have in your kitchen. 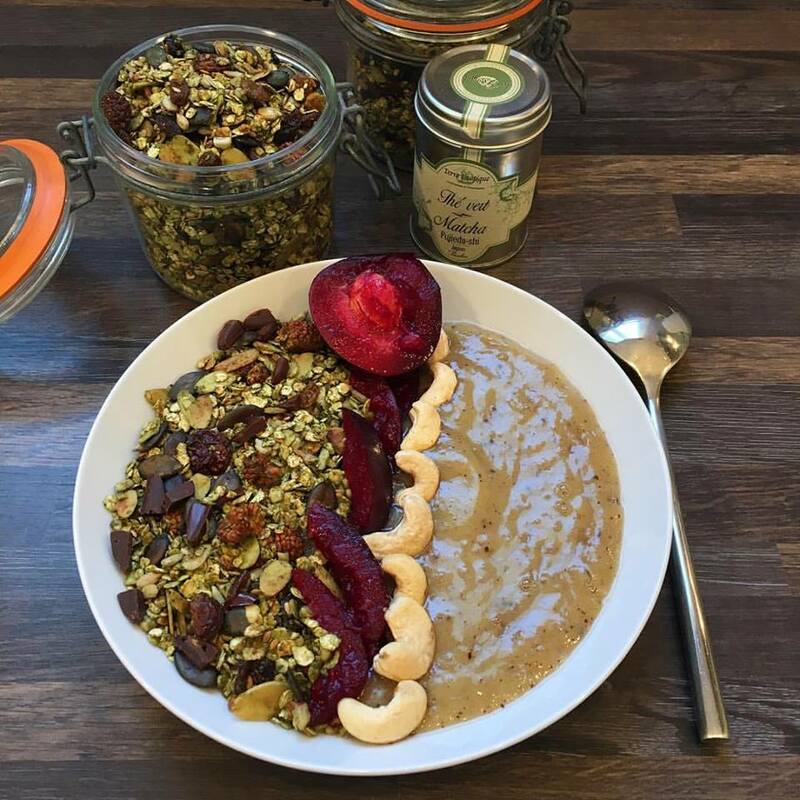 If you follow me on Instagram @newlifekarma you have already noticed that I love my smoothie bowl in the morning. This is my everyday treat and so important for me in my balanced diet. The first meal of the day is the most important one whilst dieting. It gets you off to a good start and avoids you snacking before lunch. I started looking for a recipe for muesli when I realized the quantity of additives and preservatives that were in store packets, even organic ones. This method is perfect and can be kept for two to three weeks when stored in a cool dry place, in airtight jars or containers. I used my glass jars « Le Parfait », which can hold up to 350ml and I filled 3 and 1/2 jars. I started by making the *puffed quinoa first. All you need to do is place the required amount of quinoa in a hot saucepan with melted coconut oil, coating the bottom of the pan. It doesn’t pop like popcorn but makes a similar sound. The quinoa will take on a golden color. Let it cool while you take out the other ingredients. Mix all the dry ingredients together in a bowl first, then add the honey, maple syrup, vanilla extract and coconut oil. Mix well as all of the dry ingredients must be coated with the honey etc. Line a baking tray with baking paper and spread out the mixture into a thin layer. Cook for 10 to 15 minutes until golden. All ovens are different, you need to watch the muesli after 10 minutes to be sure for it not to go too brown. Take the tray out of the oven to cool, before transferring into jars. Once the mixture has cooled transfer into your containers / glass jars. I use this muesli with my smoothie bowls in the morning or as a topping in my yogurt for a snack. Pomegranate and banana smoothie with muesli and dried cranberries, with a sprinkle of coconut and Brazil nuts. Hope you like the recipe, let me know what your favorite add-on ingredients are in the comments below. Have a great day. 24/08/2016: Today I tried a new twist to this recipe, inspired by One Nice Kitty. Instead of the cinnamon, I added two heaped teaspoons of Matcha tea. It was so delicious. Précédent Jour 1: Pourquoi faut-il boire de l’eau quand on veut perdre du poids? 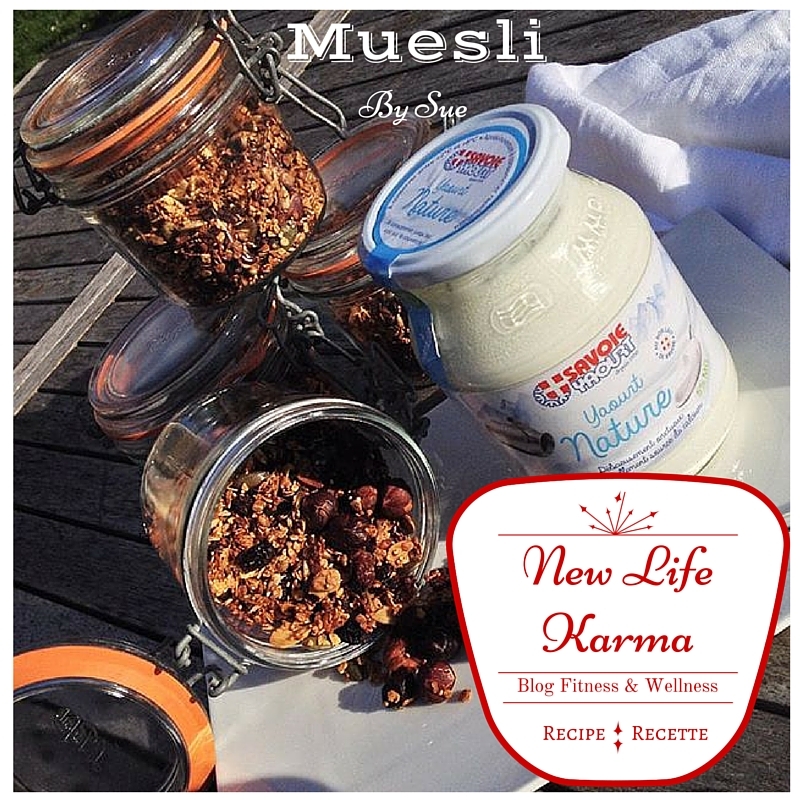 Suivant Recette Vegan: Muesli Maison, Simple et Rapide à faire soi même.